Casualties are feared in a gun battle between Maoist rebels and supporters of the ruling Communist party in the Indian state of West Bengal. A five-hour battle ended after police arrived to break up the clash. Villagers in the West Midnapore region said that up to 25 people may have been killed or injured in the clash which began on Monday night. Separately, a top Maoist leader has been arrested in the capital, Delhi, a rebel spokesman said. Kobad Ghandy was in charge of spreading the rebels' influence in urban areas and running the publications wing of the Communist Party of India (Maoist), reports say. Ghandy, who grew up in Mumbai in an upper middle-class Parsi family and went to a public school, was taken into custody for 14 days, reports say. Maoist-linked violence across central and eastern India has killed 6,000 people over the past 20 years. Last week at least seven Maoists and one soldier were killed in a battle in the central state of Chhattisgarh and more than 20 police were killed in the eastern state of Jharkand. The gun battle began after the rebels surrounded an office belonging to the Communist Party of India (Marxist) at Enayetpur in West Midnapore district on Monday evening. Rebel leader Kishenji told the BBC that the Communist supporters had hoarded a large number of weapons at the party office in order to carry out attacks against villagers who supported the Maoists. "The party supporters were harassing local women, so thousands of villagers led by our fighters encircled the party office," he said. The rebel leader said four local tribal women had died in the gun battle. More than 30 Communist party supporters have been killed by rebels in the Midnapore region since the West Bengal government launched a security offensive against Maoists in June. The offensive was initiated after the Maoists had taken complete control of the Lalgarh area in Midnapore in November last year. It took all of eight months and paramilitary troops to drive out the rebels from the area in June. The BBC's Subir Bhaumik in Calcutta says the insurgents and the CPI(M), which has been the state's dominant political force, have been fighting a turf war. In the past few years, he says, the Maoists have extended their influence with guerrilla commanders camping in the area and providing basic military training to local youths. 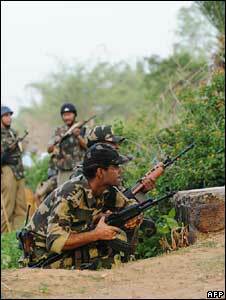 Last week, Prime Minister Manmohan Singh said India was losing the battle against Maoist rebels.